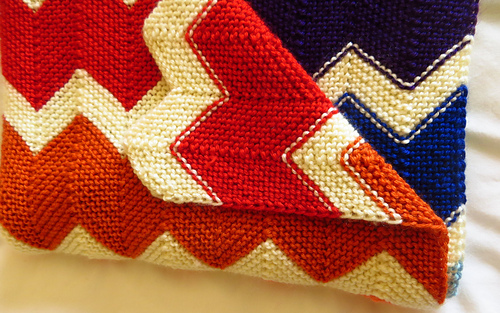 This eye-catching blanket is knitted in lovely squishy garter stitch. 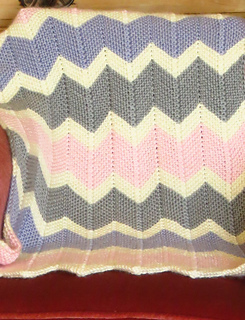 There are 2 sizes: the larger one, (shown here in rainbow colours) is suitable for a cot or throw, the smaller (shown in pink/mauve/grey) for a stroller but it can easily be made smaller or larger by adding/subtracting pattern repeats or rows. 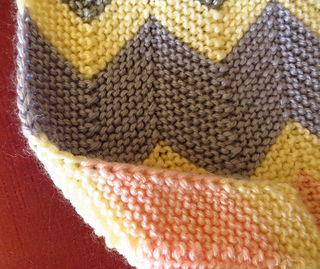 This pattern is suitable for inexperienced knitters. Increases are made by knitting into the back and front of the loop (kfb), decreases by knitting 2 stitches together.